While biking sometimes you're standing in the desert on a road crossing and there are too much choices where to go. And you look around for traffic signs, but this time there are no signs, what to do? Be a real guy and get your compass. Of course you chose number three, because real mom lovers stay at home and you don't want to get killed by a local. But how to use that smart little globe trotter tool. Read and practise the lesson below and you never will be lost again. 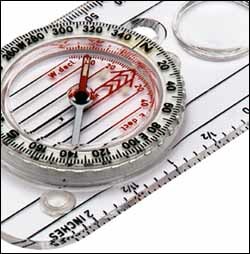 The procedure below describes how you can reach your target by using a map and a compass. 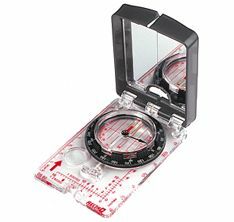 Place the compass on the map with the edge of the compass along the desired line of travel. 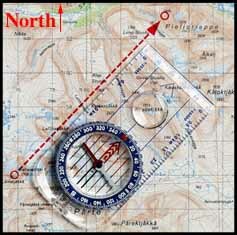 Rotate the compass housing until N on the dial points North on the map. Check that the compass housing red/black north/south lines are parallel with the maps meridians. Hold the compass in your hand and turn yourself until the red end of the compass needle (North) coincides with the red arrow in the bottom of the compass housing. The front of the compass with the direction of travel arrow is now pointing towards your destination. Now you're well trained enough to use the compass, but you still can get lost. Most people think compass gives the direction of the North Pole, but this is an mistake. A compass point to the direction of the magnetic North, which is located somewhere in North Canada. 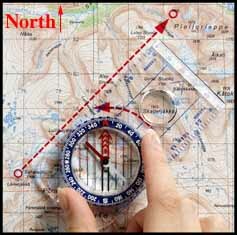 The difference between the real north and the north given by the compass is called declination. When the declination is known the real north can be calculated. For West declination the angle is negative for East declination it is defined as positive. How to compensate for West declination? When you are in an area of west-declination (negative declination) you have to add the angle but possitive to compensate the compass reading. So for -20° declination you add 20° to the compass reading to get the geographic north. How to compensate for East declination? When you are in an area of east-declination (positive declination) you have to subtract the declination angle to compensate the compass reading. 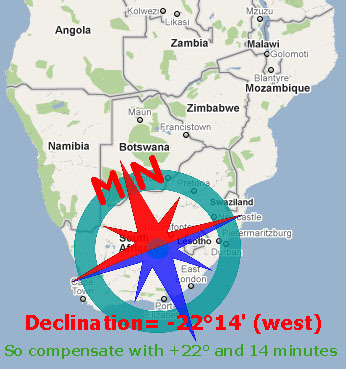 So for +20° declination you subtract 20° to the compass reading to get the geographic north. When your compass has a declination scale turn the declination scale to 22 deg west declination. Then make sure the needle is inline with the 22 deg west declination scale, now your compass points to the geographic north. You can find this declination scale at the inside of the degree scale (red). At the left is written W-decl (West-declination), and at the right E-decl (East-declination). A red arrow is painted on the scale as well this indicates the direction of the magnetic north. To make it more complex the declination is not constant, it differs from time to time and depends on the place where you are. By using the next charts you can find the declination of the place where you are. Note: The annual change is given in minutes per year! One minute equals 1/60 degree. On the left you can see the variation of the declination over time for Amsterdam. People living in western Europe experience hardly no declination today but in 1900 this was quite different.